The cherry blossoms are almost at their best in Kyoto and people are saying that they are most beautiful in the last 10 years. And we had a party with the people from “Sakurai (ryoutei restaurant)” under the cherry trees. 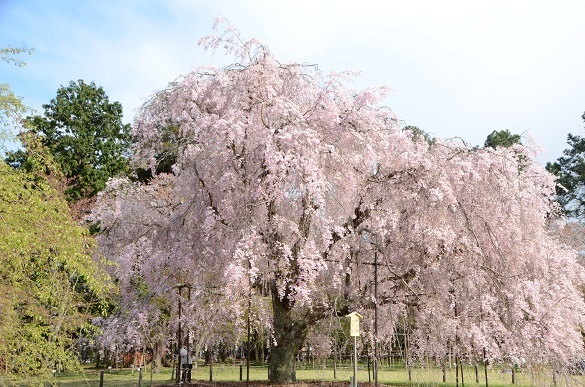 We had a very good time talking about various topics such as the origin of the row of cherry trees or the weddings held at Kamigamo shrine in the past. It was a precious opportunity for us to learn many things from Sakurai people. I really enjoyed the conversation with them. And what I discovered was they always spoke wholeheartedly. I’ll do my best to provide the hearty service to our clients any time. Thanks for the wonderful time, Sakurai people!